The map above shows the main routes to the major attractions. 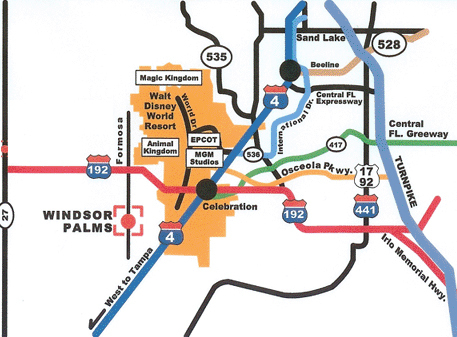 Windsor Palms is only 3 miles from Disney World, 5 miles from Sea World and 7 miles from Universal Studios. Exit Airport and follow signs towards Rt. 528 West (The Beeline Expressway). Follow Rt. 4 West past Sea World and all Disney exits. You are looking for Rt. 192 West. Exit onto Rt. 192 West. Turn left onto Formosa Gardens Boulevard between Markers 5 and 4. Continue on Formosa Gardens Boulevard for 2.2 miles. Turn right into Windsor Palms.